1. Explore a new city. If you LOVE to travel, this is the perfect chance to discover a new city and see all the sights. My favorite book, “1,000 places to see before you die“, lists the famous Philly cheesesteak place Pat’s, and his rival, Geno’s as a must taste. If you’re a foodie, there’s also Restaurant Row, which houses the famous Striped Bass, Susanna Foo, and Le Bar Lyonnais. History buffs can check out Franklin Court, Betsy Ross House, the Liberty Bell and Independence National Historical Park. Museum lovers can enjoy the Rodin Museum and the Philadelphia Museum of Art, which houses the Rocky Balboa statue – perfect for taking a selfie! Also, check out the CityPass website for great discounts and deals on all the Philadelphia sights. 2. Reunite with old friends. #AOTA17 is a great opportunity to meet up with friends from university, colleagues from previous jobs, and professors from the old days. Social media makes it easy to stay in touch afterward, too. Plan to share a hotel room with your roommate from college. It will be just like old times! 3. Connect with other Occupational Therapists. You are not an island! Many OT practitioners work alone or with only a PT. It’s awesome to have another OT to trade ideas, share activities, and collaborate on meeting goals together. Going to #AOTA17 will put you into “OT shock”. OTs are everywhere- in the elevator, next to you at the restaurant, and most of all, sitting next to you at the conference. It’s AWESOME. AND it’s so nice to “talk shop” with other OTs. 4. Learn new skills and keep up with current events. AOTA has an app where you can plan out your conference schedule. You can enjoy multiple workshops each day on the topics you’re interested in. You can customize each day to your liking, and there are hundreds of courses to choose from. AOTA hosts courses to keep you up to date with changes in law, best practice guidelines, and the latest research. For OT students, there are sessions about exam preparation and ethics in the workplace. Check out the app here. 5. Get your Continuing Education Units. In a course of three days, you have the opportunity to get up to 24 Continuing Education Units (CEUs)! 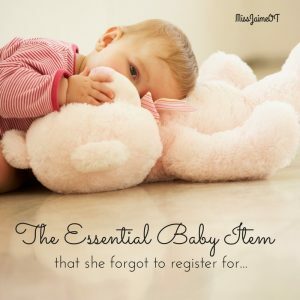 For the busy OT practitioner, this can be a life-saver. 6. Discover new products, companies, and job opportunities at the AOTA Expo. This is one of my favorite parts of the AOTA conference. Hundreds of companies gather to persuade thousands of OTs to try products, buy books, sign up for courses, etc. Plus, there are tons of free giveaways, prizes, and samples. Who doesn’t love free samples? 7. Meet famous OTs! Everyone has different Occupational Therapists that they admire or look up to. As a pediatric Occupational Therapist, I was thrilled to meet Theresa Garland, author of one of my favorite OT books, Self-Regulation Interventions and Strategies. Meeting “Handwriting With Katherine” and “MamaOT” was the highlight of #AOTA16 for me! As a pediatric OT blogger (MissJaimeOT), I was totally psyched to meet two fellow OT bloggers, Christie Kiley (MamaOT) and Katherine Collmer (Handwriting With Katherine). Christie lives in California and Katherine is from Arizona. As a result of the AOTA conference, I had the opportunity to meet them in person! 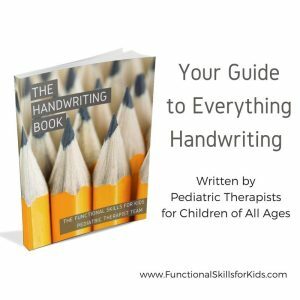 Now, I’m in touch with both of them, and Christie and I actually collaborated with other OTs and PTs to write “The Handwriting Book”, which was recently released by the Functional Skills for Kids team! For me, these are “famous OTs”, but that would depend on what kind of OT YOU are and who YOU’RE excited to meet. 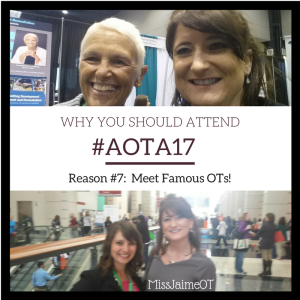 Chances are they’ll be at #AOTA17! 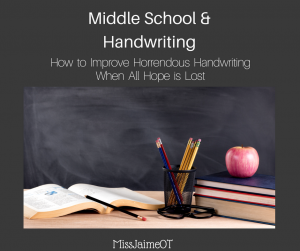 A comprehensive guide to all things Handwriting! 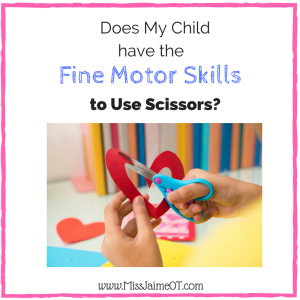 Written by a team of pediatric OTs and PTs. 8. Rediscover why you chose to be an OT practitioner. Attending the conference will make you excited about OT again. If you’re feeling bored or unmotivated, #AOTA17 will have you on fire with ideas and things you’re looking forward to doing. The enthusiasm is contagious! Connecting with other practitioners is invigorating, and listening to their ideas and success stories can revitalize your role as a practitioner. 9. The keynote speakers will inspire you! #AOTA16 keynote speakers were Jessica Kensky & Patrick Downes, two survivors of the Boston Marathon bombing. The couple had the audience laughing, crying, and speechless during their 30-minute presentation outlining their traumatic ordeal, recovery, and experience with their Occupational Therapists, who “helped give our independence back, our lives back, our love back”. Listening to that speech was one of the highlights of my career as an OT, and it made me very proud of the profession I chose. I highly recommend seeing it for yourself on YouTube. 10. Use turn-key teaching to bring your new skills and ideas back to your workplace. Bring your new knowledge back to your organization. 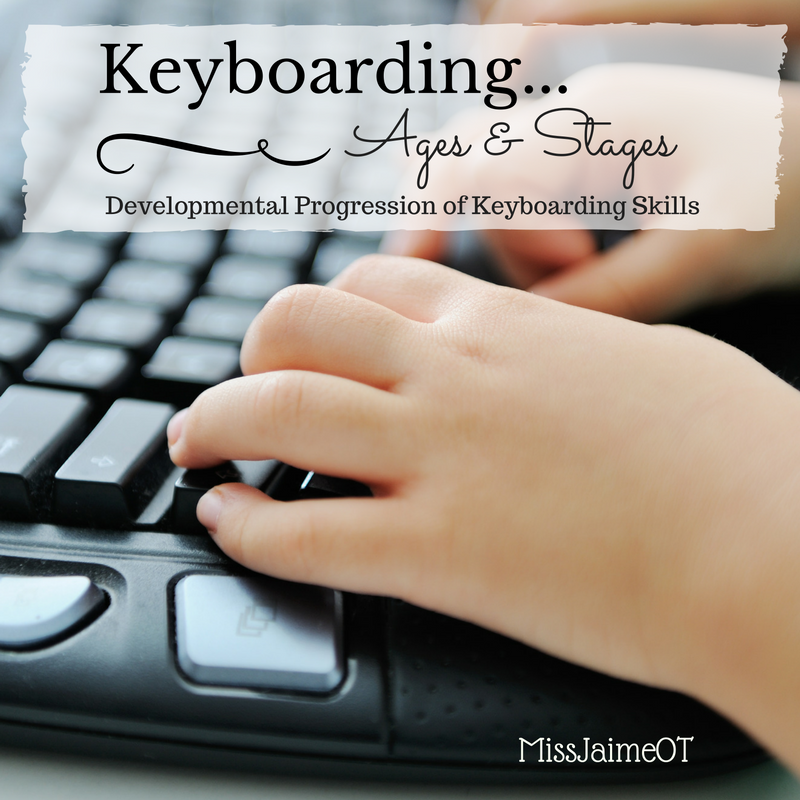 Turn-key teach other OTs and professionals. It’s a wonderful way to showcase your new proficiency and expertise. Administrators will admire your eagerness to promote your profession. Plus, it may make them more willing to pay for you to go the following year! 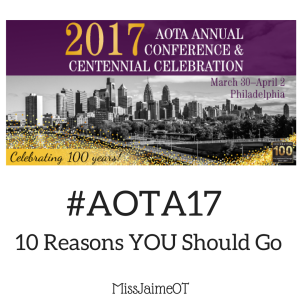 #AOTA17 is guaranteed to be amazing! Find out if your workplace provides reimbursement for conferences and put in early. Check the AOTA.org website frequently to see when the discount hotels are listed. Then, call your friends to convince them to share a room with you! Explore the discount travel websites for a cheap price on flights. Don’t forget to check Amtrack or Megabus, which has discount seats starting at $1.00! Look for a copy of this article in the upcoming issue of OT practice! Ok so I totally had a similar experience. I had been in practice for 5 years and never been to a conference before. Honestly, thought they were a waste of time. Found out it was going to be in Nashville and had always wanted to go there. Went, feel in love, and haven’t missed an AOTA since, even attended WFOT last year in Capetown. Totally a convert now!